After their successful video release of Reuben’s Train, Hogslop String Band is back with a brand new video, John Henry. 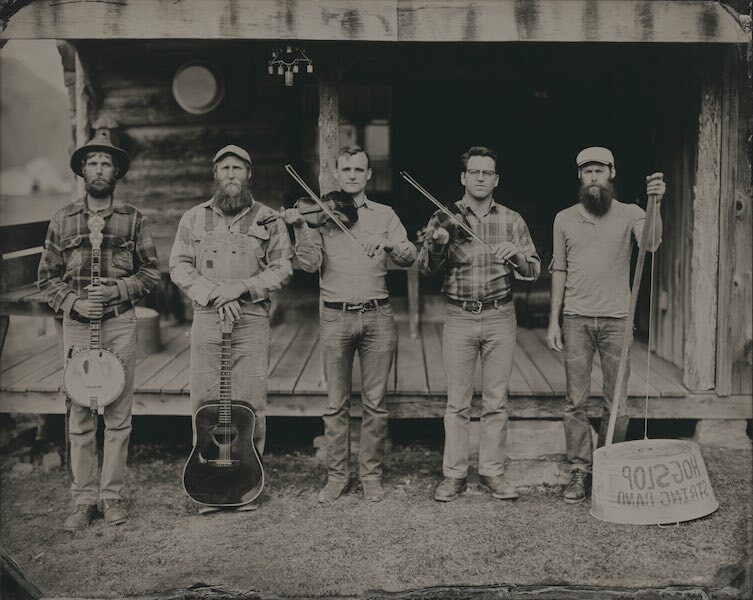 The Hogslop String Band is a Nashville based old-time string comprising five energetic young musicians hailing from Georgia, Tennessee, California and North Carolina. The band features Casy Meikle and Kevin Martin on fiddles, Graham Sherrill on banjo, Gabriel Kelley on guitar and Casey “Pickle” McBride on the washtub bass. These boys surely raise a ruckus. Upon forming as a pickup square dance band in the summer of 2009, The Hogslop String Band has since become one of the most sought after old-time string bands. Known for their outrageous facial hair and a rollicking repertoire heavily based on Georgia and Middle Tennessee fiddle tunes, these boys have provided entertainment for fashion shows, political conventions and whiskey distilleries as well as countless weddings, festivals and soirees. Following in the footsteps of such country music luminaries as Uncle Dave Macon and Gid Tanner, they put on a high energy show easily appreciated by both young and old alike. Despite an unkempt appearance, their undeniable charm is as certain to steal your heart as it will your daughters. Stay tuned for some incredible drone video coming soon of the Hogslop String Band during the World’s largest square dance held last month at Uncle Dave Macon Days. Hogslop is the real deal groovilicious honkin old-time string band. Guaranteed old-time awesomeness with these fellas around – Abigail Washburn. One of the finest square-dance bands on the planet – Jack Silverman.